Personalize this double-heart signet ring with your choice of 2 initials (one per heart symbol). Made in .925 Sterling Silver. Also available in yellow gold, white gold, or rose gold, shown below. Engrave 1 Character per Heart. Choose from: Bookman Old Style, Colonna MT, Edwardian Script, Lucida Handwriting, Old English, Roman Monogram, or Script MJ Bold. 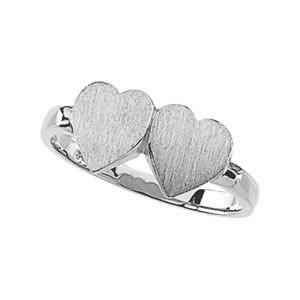 We guarantee our Double Love Heart Signet Ring in Sterling Silver to be high quality, authentic jewelry, as described above.